AND READY FOR HER NEXT OWNERS. Too many items to list. See Full Specs. cruising her way to Florida. She can be purchased in the islands or while en route. 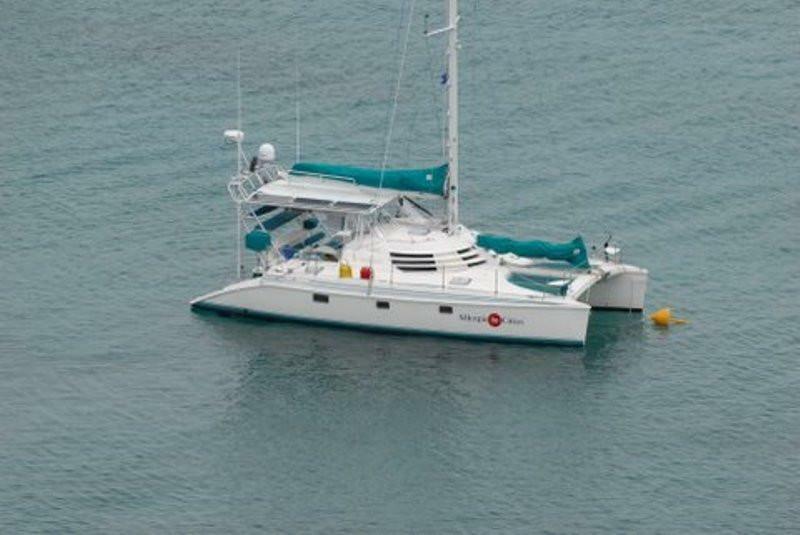 This beautiful vessel is completely appointed for long range cruising with the "Owners" version layout. 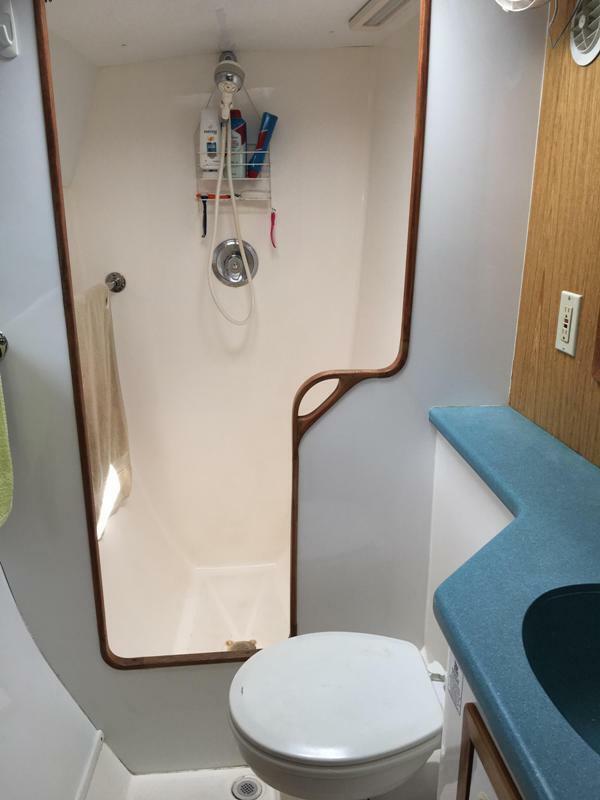 The Port Hull features the Owner's Suite with Master Stateroom and private Head with separate shower. 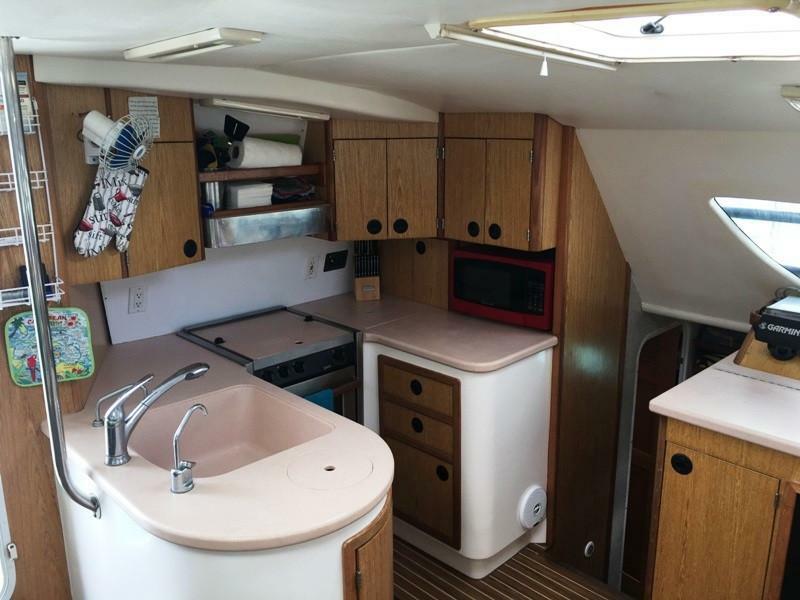 Pantry storage and multiple built-in book shelves and storage cabinets line the ort hull companionway. 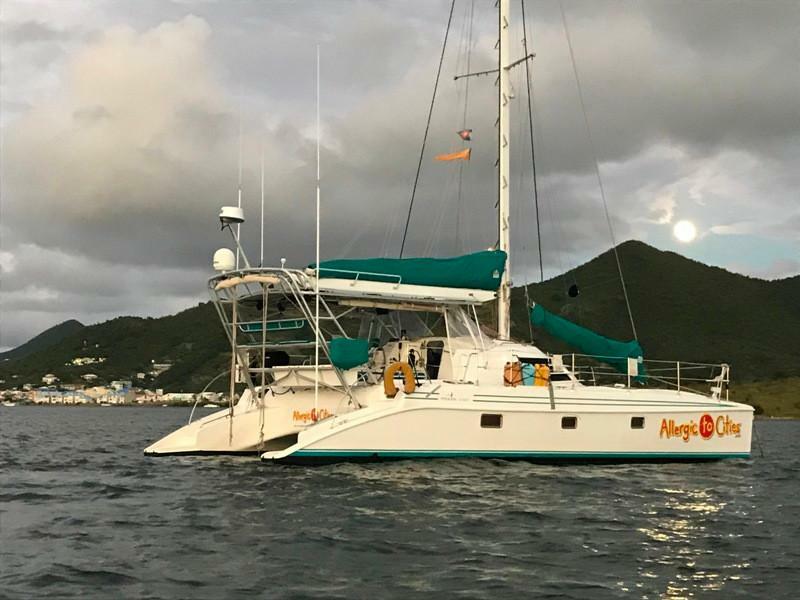 The Starboard Hull features an aft VIP Guest Stateroom and a forward Guest Stateroom. 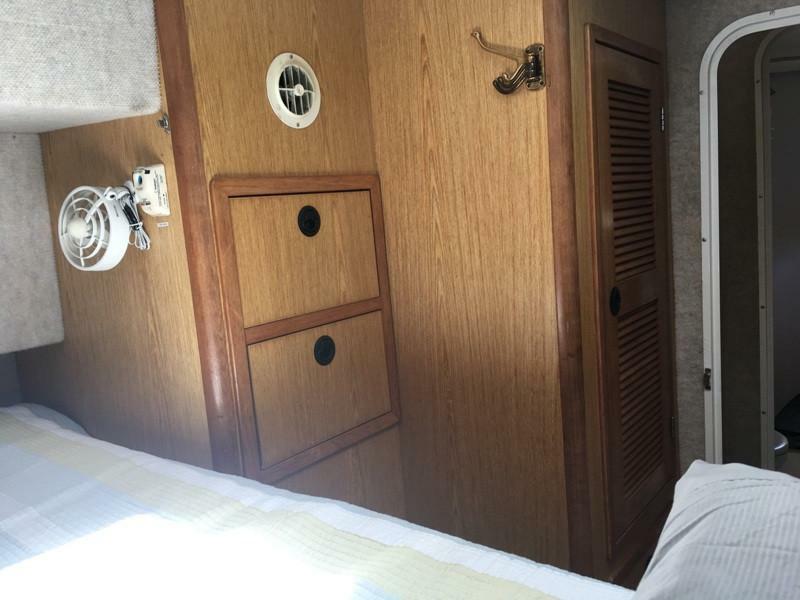 A Guest Head is shared and built-in bookcases line the companionway. 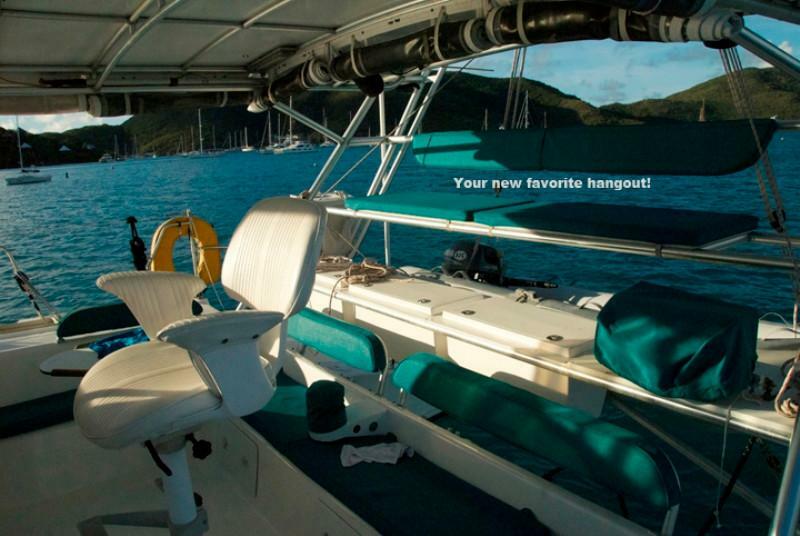 The vessel includes a fully equipped Galley and an inviting and relaxing Salon for lounging and entertaining. 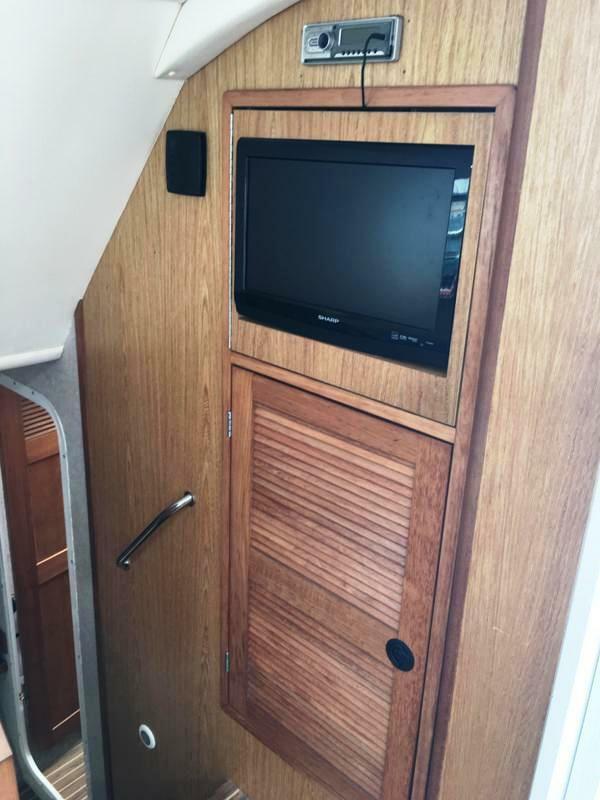 Interior woods are varnished maple veneer and teak trim throughout. Solid door trim and louvered teak doors. Simulated teak and holly pressurized laminate soles are very durable and maintenance-free. 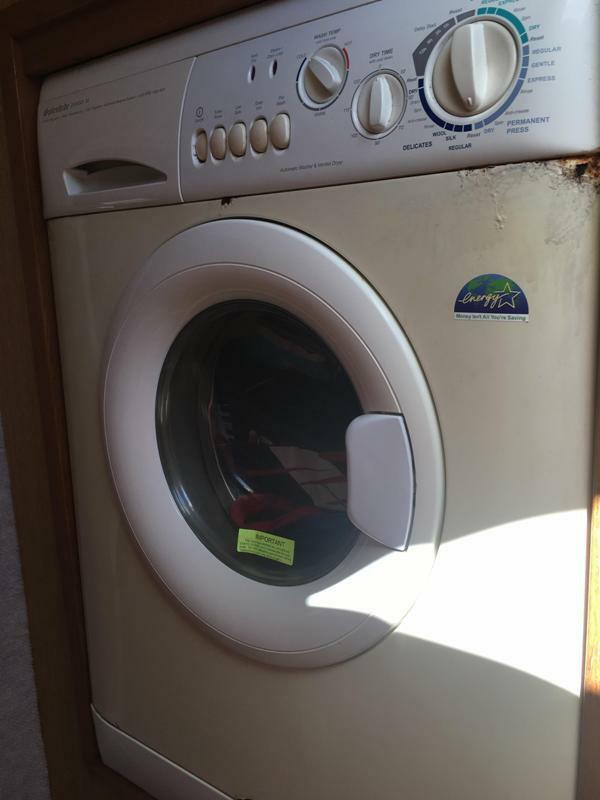 Splendide Washer/ Dryer (in Starboard Hull forward Guest Stateroom). Spectra Newport 400 Water Maker. 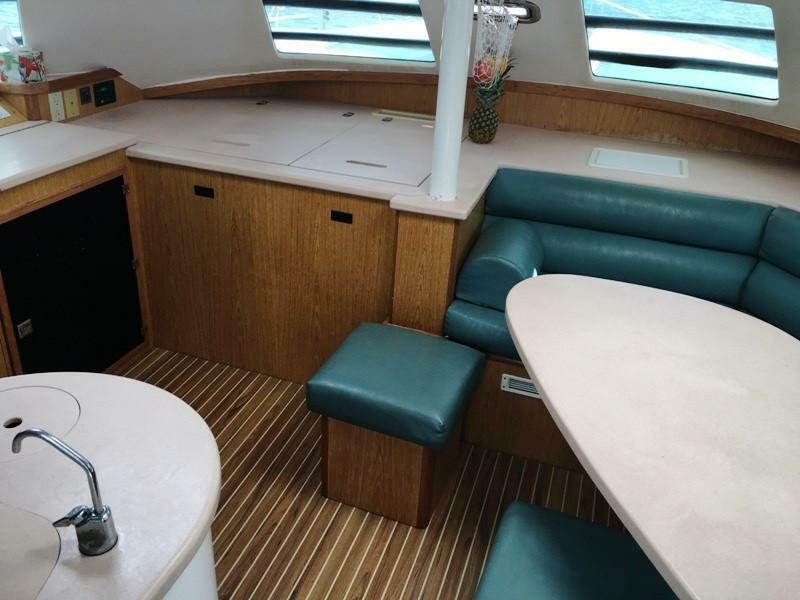 Salon / Dinette / Nav Station area is open to the Galley. L-shaped teal UltraLeather upholstered settee with accent pillows and storage under. (2) Matching upholstered ottomans with storage. Large adjustable table with Corian surface for dining or entertaining. Locker with storage shelf and floor drains. Sharp 19” flat screen TV built in above locker. Chart table with flat chart storage area below. Standard Horizon GX2150 VHF/AIS with Matrix AIS VHF Radio. ICOM M710 SSB radio with AT140 tuner and Pactor II Modem. 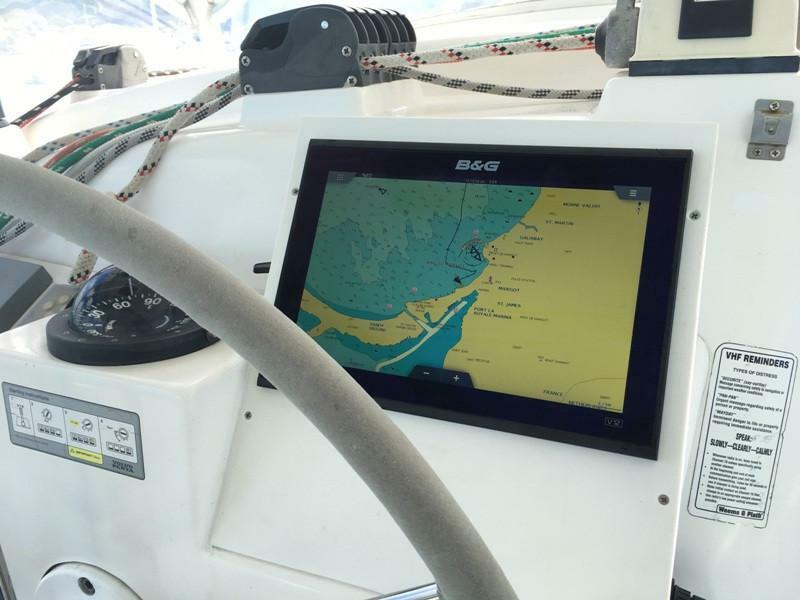 Garmin GPS Map 478 Chart Plotter/AIS. Spectra MPC 300 Water Maker controller. 12V, Telephone and NMEA Outlets. RV Power Products SB50 Remote Solar Display. Electrical panel with system breakers and electrical and generator controls. 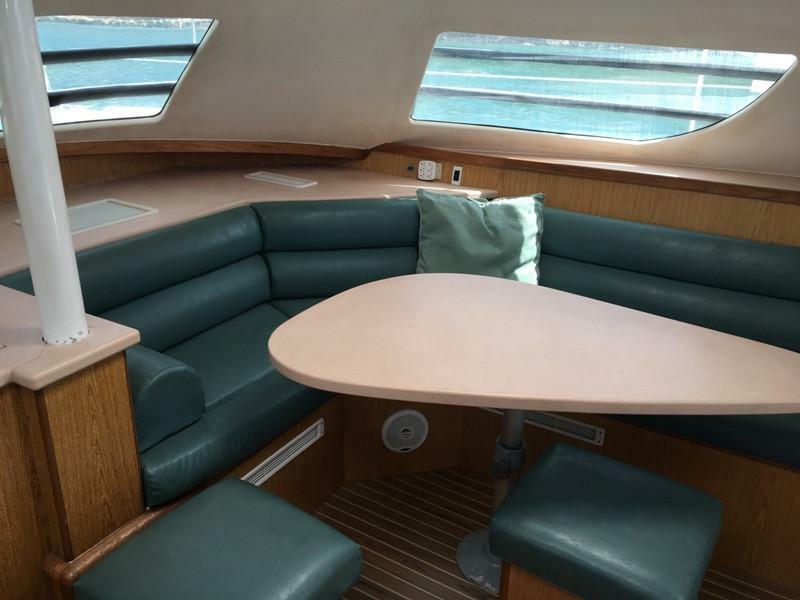 U-shaped Galley is up and to port, open to the Salon / Nav Station. 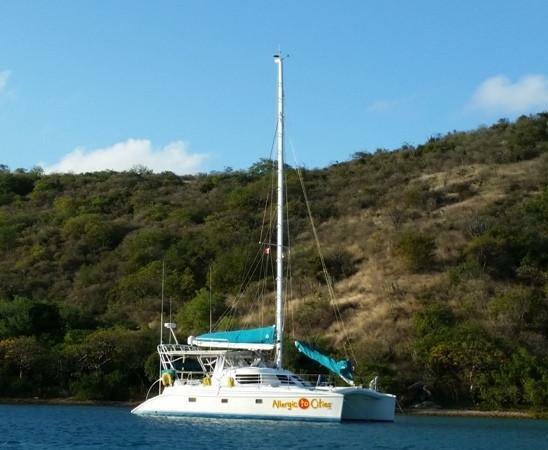 Large Galley pantry is located in Port Hull. Super efficient, heavily insulated, top-loading 12V Adler Barbour Super Cold Machine Fridge/Freezer - 10 ft³ (60/40). Force 10 (3) burner stove with cover and oven. Large integrated Corian sink with Corian cover. Pressurized single handle sink faucet. Fresh water foot pump for sink use. Seagull IV .01 drinking water filtration filter/spigot . Built-in countertop access trash chute with cover. 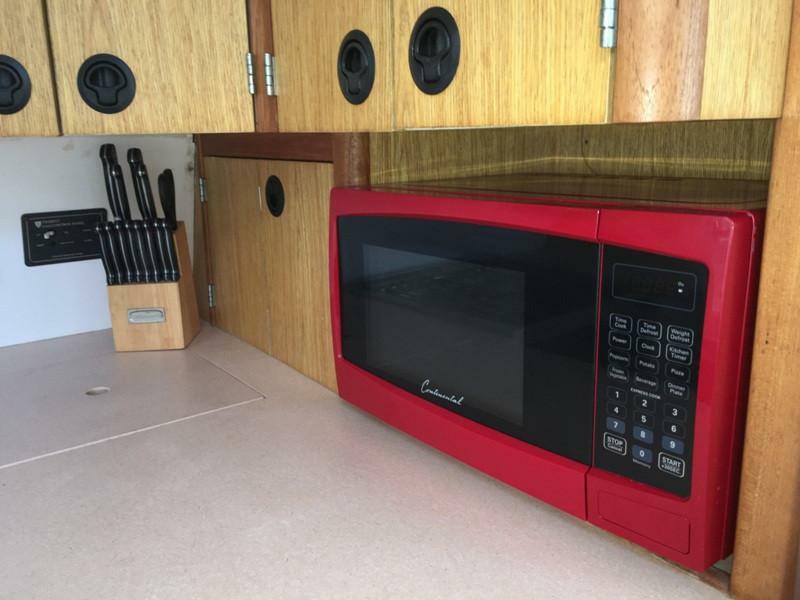 Built-in counter storage with cover. Multiple upper and lower cabinet storage and drawers. 20lb Propane tank, with shut-off solenoid. Owner’s Master Stateroom is aft. Private Head forward with separate full shower. 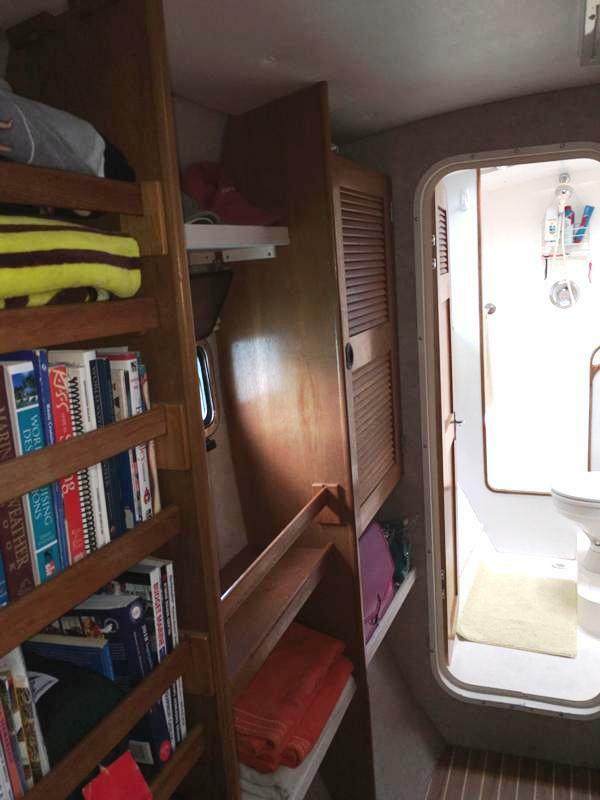 Companionway between Stateroom and Head with multiple custom built-in bookcase and optional storage cabinet and opening portlight on one side and generous pantry storage inboard. 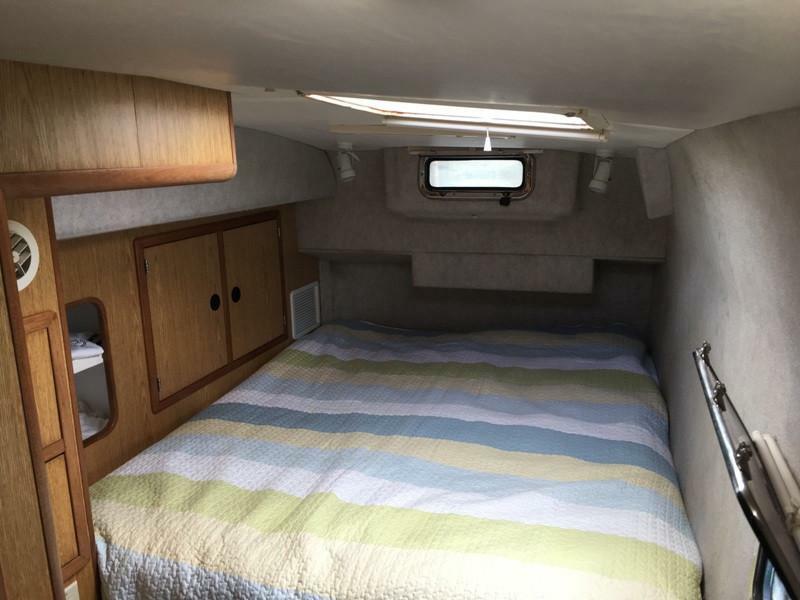 Queen Select Comfort 50/50 air mattress berth arranged fore to aft. Cedar-lined closet with louvered doors. (2) Stainless steel opening portlights with screens and shades. Jabsco QuietFlush electric marine fresh water toilet. Vanity with Corian countertop, sink and storage below. Separate extra large stall shower with shower head and water controller and towel bar. Stainless steel opening portlight with screen and shade. VIP Guest Stateroom is aft. 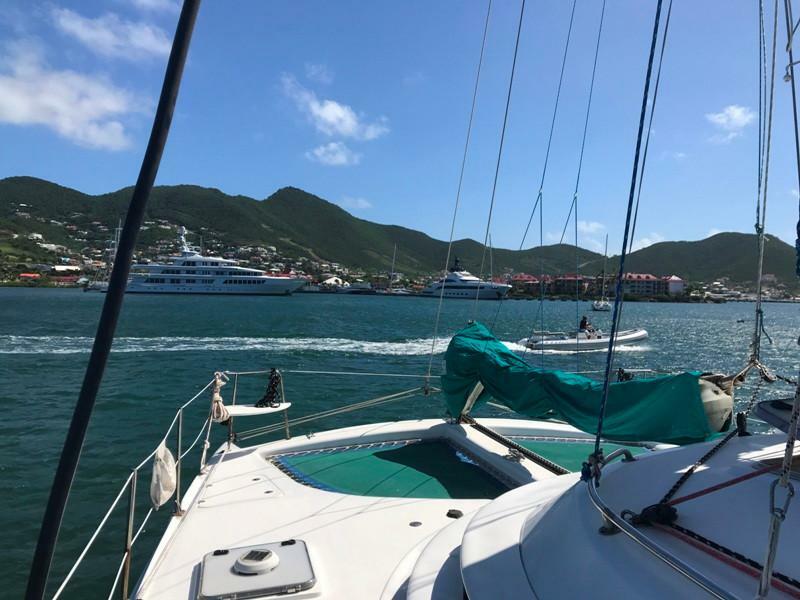 The Guest Head can be accessed from the companionway or the forward Guest Stateroom. Large custom teak bookcase. Custom overhead storage cabinet forward. 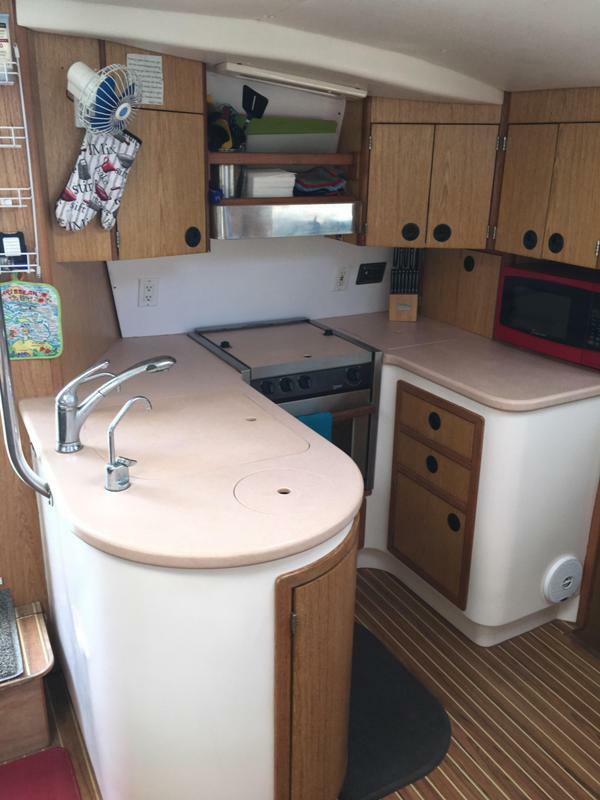 Splendide Washer / Dryer combo with storage cabinet below. Separate shower area with shower head and water controller. Amec Camino AIS class B with Cubo 162 Antennae Splitter (NEW 2017 @ $1000). B&G 12” Touch Screen Chart Plotter (NEW 2019 @ $4500). 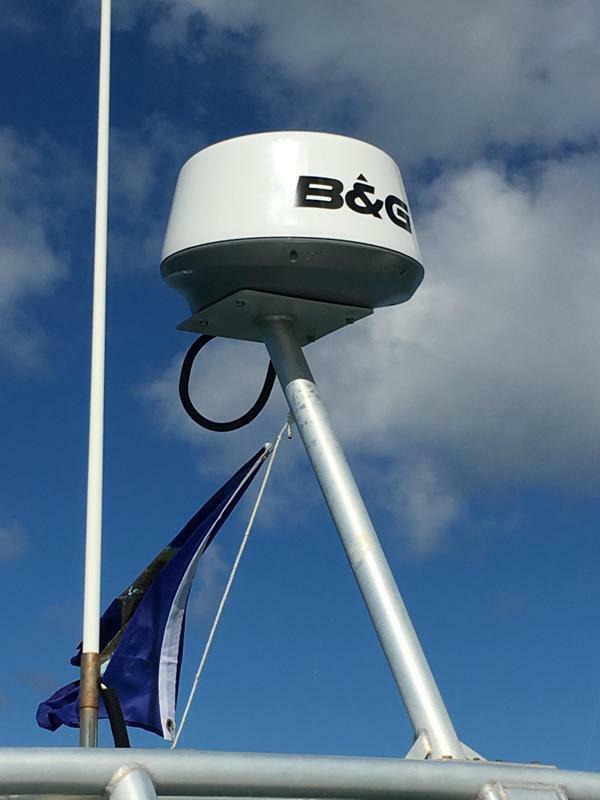 B&G 3G Radar (NEW 2019 @ $2000). 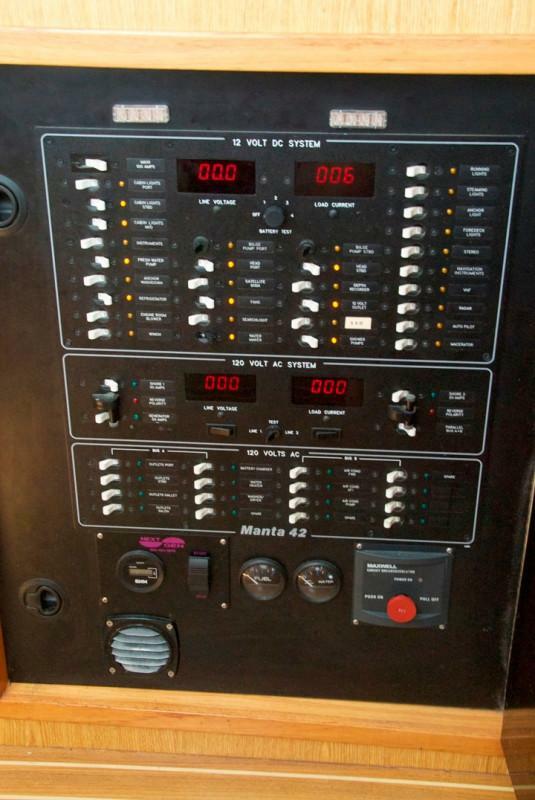 Raymarine ST6001 Auto Pilot Controller. Standard Horizon VHF Radio with AIS Receiver GX2150 Matrix AIS. ICOM M34 Floating/Waterproof Handheld VHF Radio. ICOM M-710 SSB Radio with AT140 Tuner. 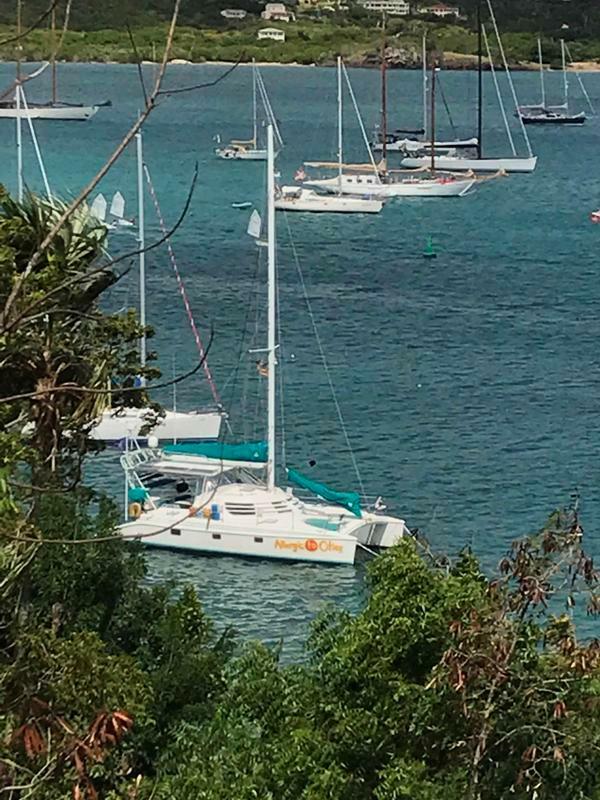 AIS System to assist in safely identifying surrounding yacht traffic by name, location, direction and size (NEW 2018). Hi-Gain Antenna (VHF) on Radar Arch and Mast. Sharp 19” flat screen TV in Salon . Clarion MP309 Stereo/DVD/AM/FM/CD player tuner. (2) Stereo Speakers in Salon and (4) Waterproof Speakers In Cockpit. 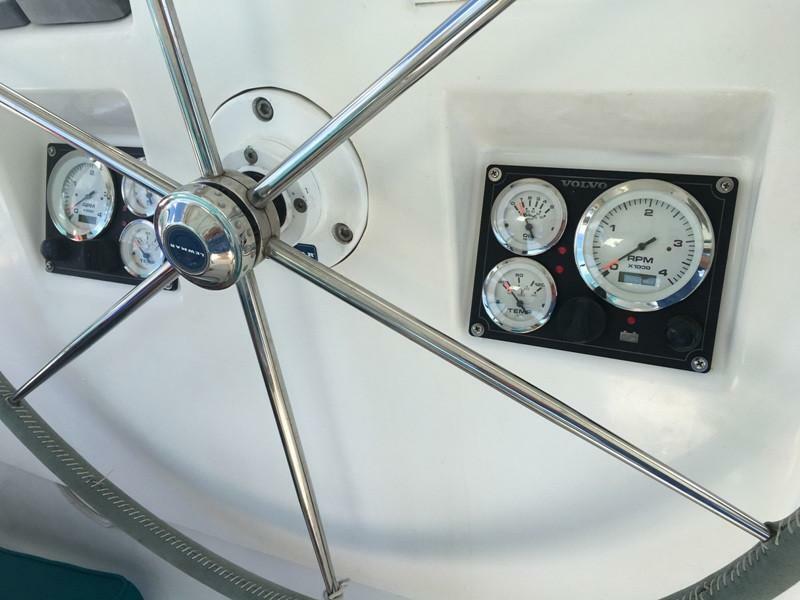 ACDC Marine Electronics Custom Ignition Switches, Water Temp /Oil Pressure Gauges (2 each) at Helm Station (NEW 2018 @ $1500). Intellian i3 Direct TV Dome on Arch. MasterVolt EasyView 5 Control Panel Monitor for MasterBus Network (NEW 2018 @ $1000). 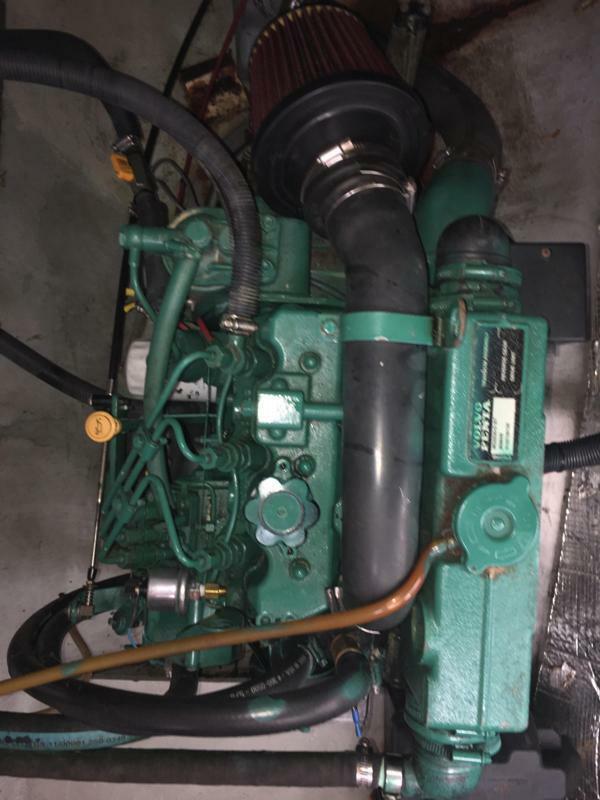 NextGen Power 5.5kW Generator - approximately 800 hrs - (Rebuilt 2017 @ $2500). (6) Lifeline GPL-4CT 220Ah Gel Batteries (1320Ah total). 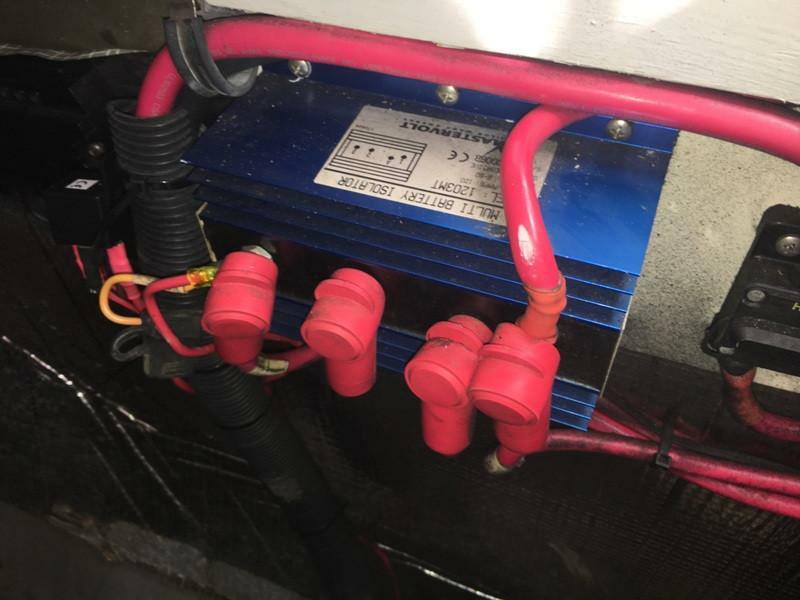 (2) Dedicated Engine 12V Start Batteries with Isolators and Combiners. MasterVolt 12-70/3 Battery Charger (NEW 2018 @ $3000). 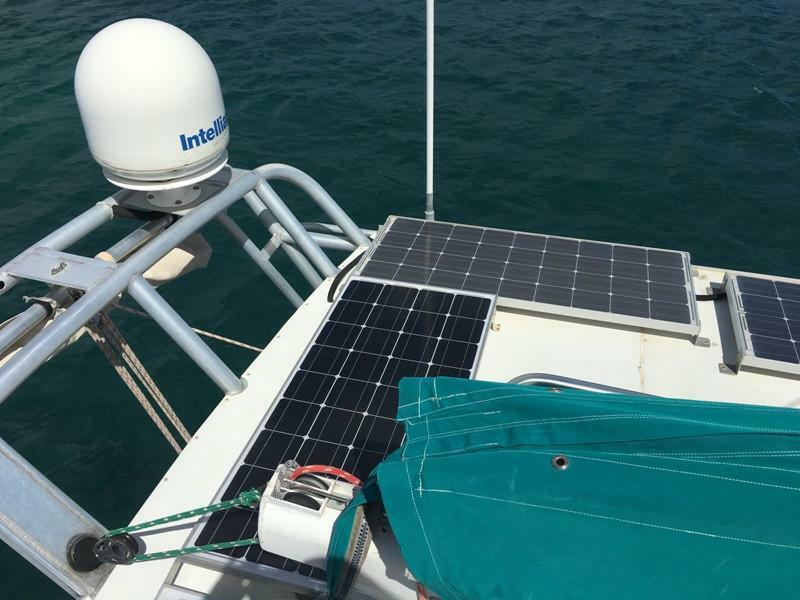 (2) 105 watt Solar Panels (NEW 2019 @ $300). RV Systems 50 Solar Controller. (2) Nicro Solar Driven Ventilation Hatch Fans. (2) 65amps Valeo Alternators on Volvo Engines (NEW 2018 @ $1200). (2) 50 ft 30amp Shore power cords. 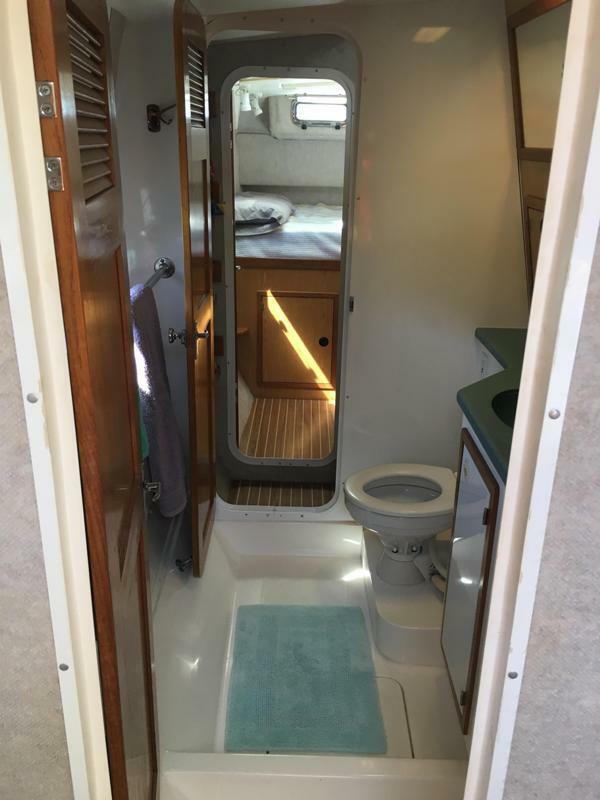 Spectra Newport 400 Reverse Osmosis 120V (16gph) Water Maker (under Starboard Hull Forward Guest berth) - rebuilt Clarke pump (2019 @ $1500). 100 Gallon aluminum water tank. 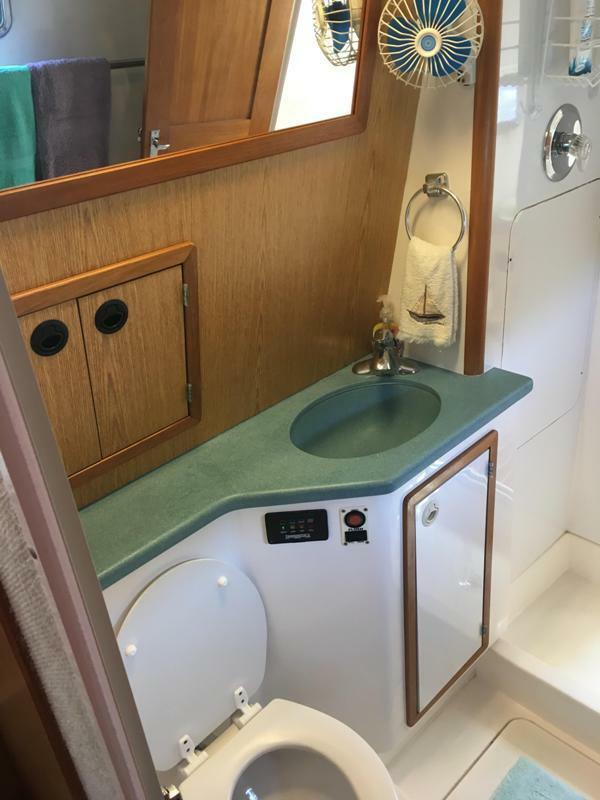 Seaward 11 gallon water heater (under Starboard Hull Forward Guest berth). (2) Jabsco Quiet Flush electric marine fresh water toilets with Y-valve. (2) 20 gallon Black waste holding tanks. (2) TankWatch holding tank alarms. (2) Rule shower sump pumps. (2) Rule automatic bilge pumps. (2) Manual Whale Gusher bilge pumps. Raw water pump for AC unit (NEW 2019 @ $400). 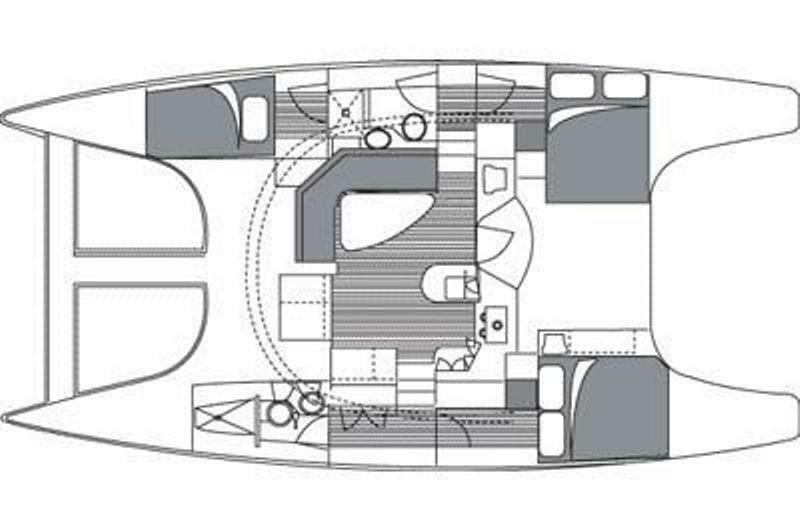 Hull, deck and bulkhead constructed of triaxial, biaxial, and unidirectional fiberglass with vinylester, isophthalic resins. Ferro Super Shield exterior gel-coat. Nida-core in subsoles and bulkheads, all vacuum bagged for stiffness, strength and light weight. Hull fastened to deck chemically and mechanically. 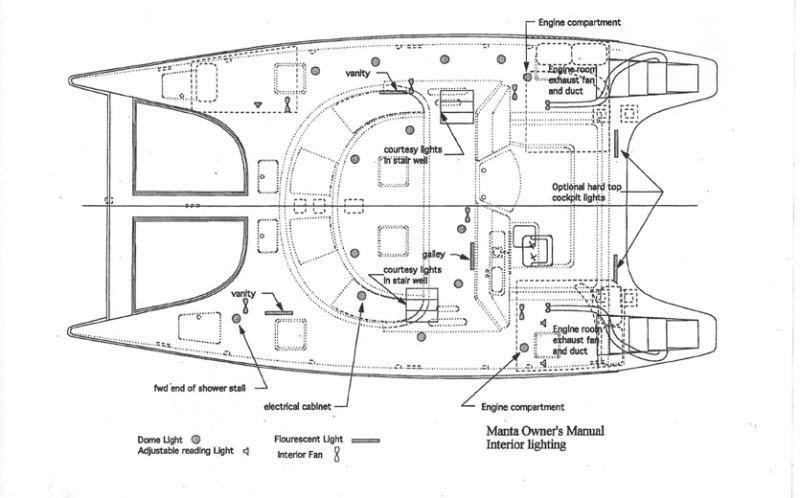 Collision bulkheads with watertight compartments in bow, stern and keels. Deck hardware reinforced with aluminum plates molded into lay-up. Twin high density foam / fiberglass rudders with 2" diameter solid stainless steel shaft. 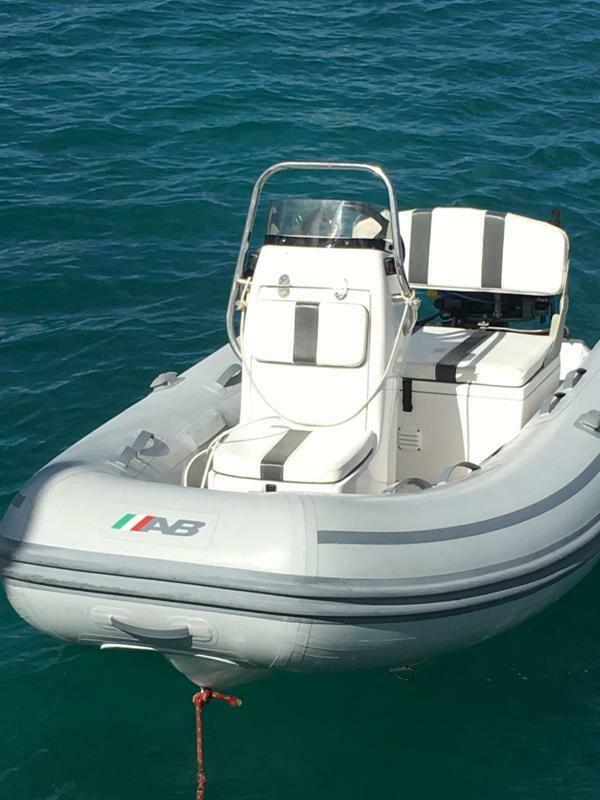 Aluminum radar arch / hardtop / dinghy davit - welded, anodized, aluminum tube construction. All thru-hulls and seacocks are non-corrosive Marelon. 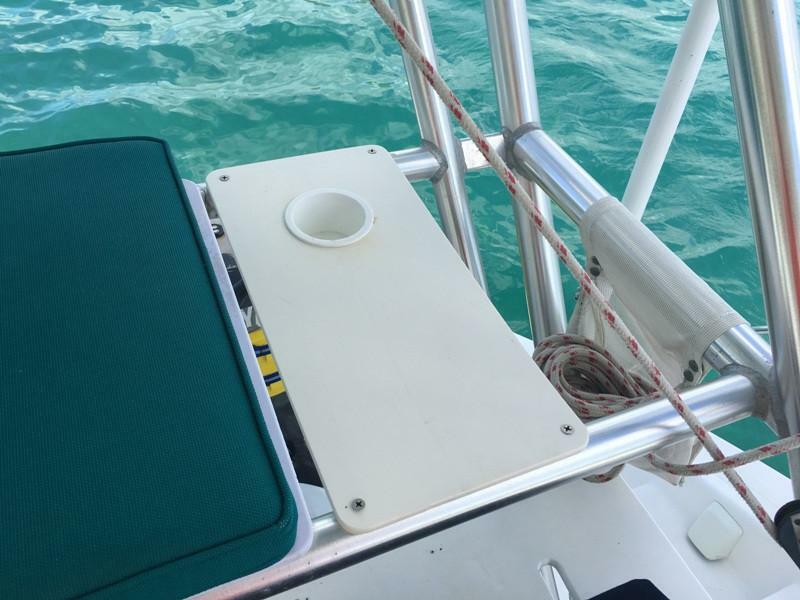 All stanchions, handrails, cleats, opening ports and hatches, locker hatches, hinges, chain plates, anchor roller, and fuel and water fills are 316 stainless steel. 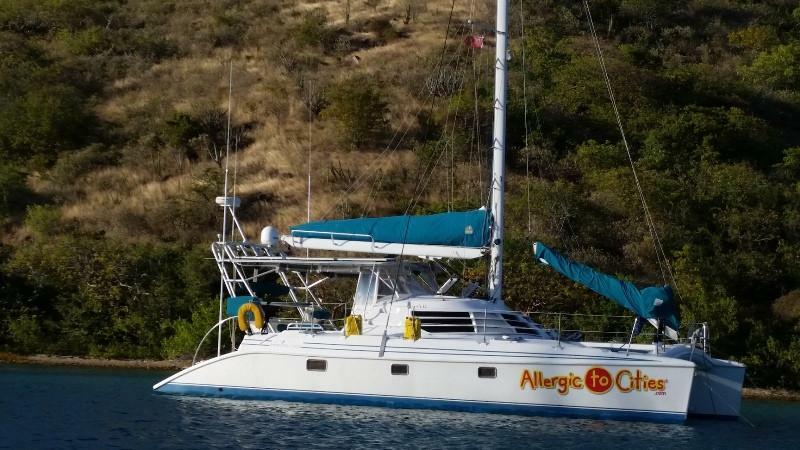 Full, sturdy, over-Cockpit aluminum hard top canopy affording easy boom/sail access. Bulkhead-mounted stainless steel steering wheel with wheel brake. 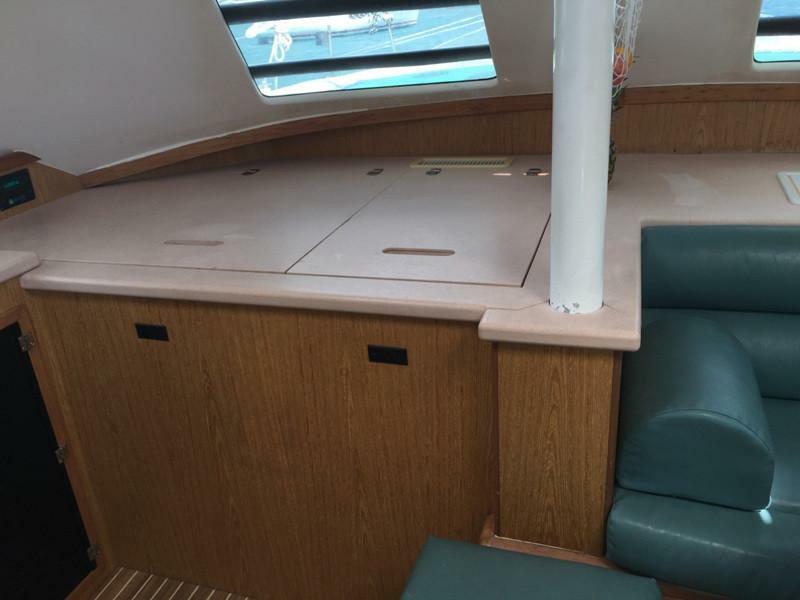 Molded console with space for instrumentation and line bin at Helm. 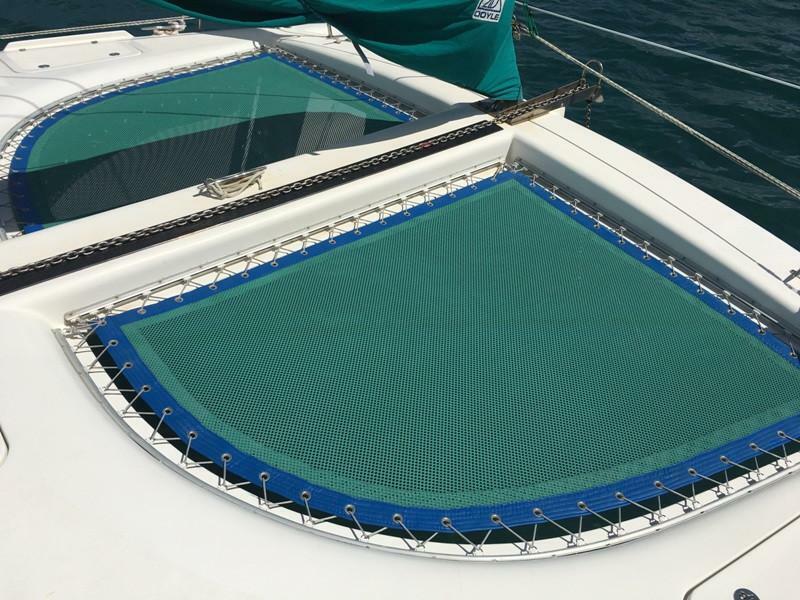 Sail control lines operable from Helm. 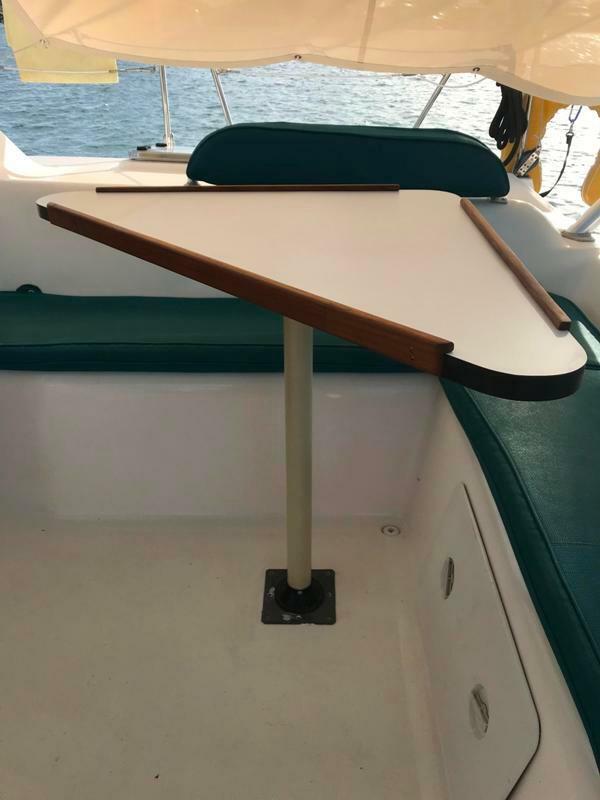 Captain’s adjustable Helm seat with foot rest. Cockpit seating with removable seat cushions and backrests. (3) Large fiberglass storage boxes on stern. Amazing, over-sized, welded aluminum Cockpit super structure with elevated bench seat at rear of Cockpit that provides 360 degree viewing station while underway (also VERY nap friendly!). StrataGlass front window shield with zippered center panel for ventilation. Additional StrataGlass panels to surround the Cockpit to provide wind/rain/bug-free Cockpit enclosure. Custom Sunbrella sun awnings (2016 @ $1500). Polycast 3/8” acrylic tinted Salon windows with sun protection louvers. Vinyl coated polyester top-of-the-line trampoline between the forward bows (NEW 2018 @ $1500). Anchor saltwater washdown system in forward locker. 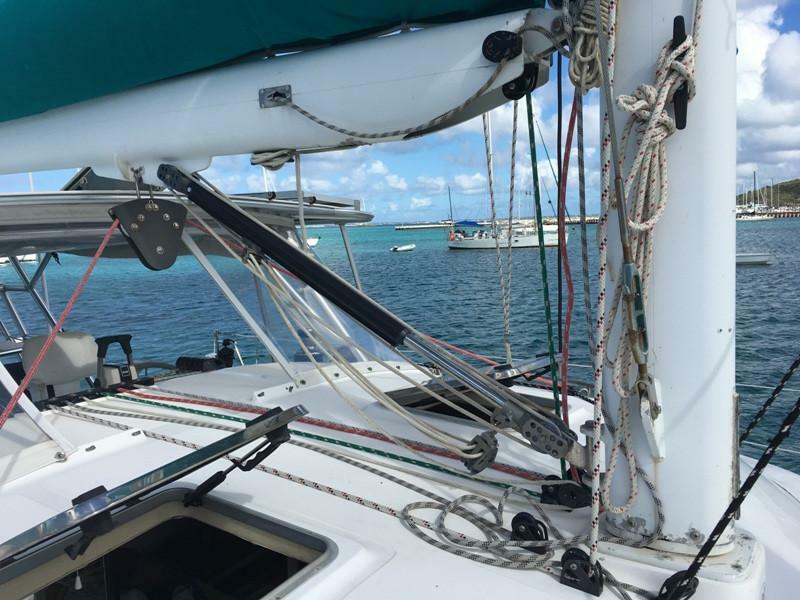 Stainless Dinghy davits, with 6:1 lifting tackle. Molded non-skid on all deck surfaces. 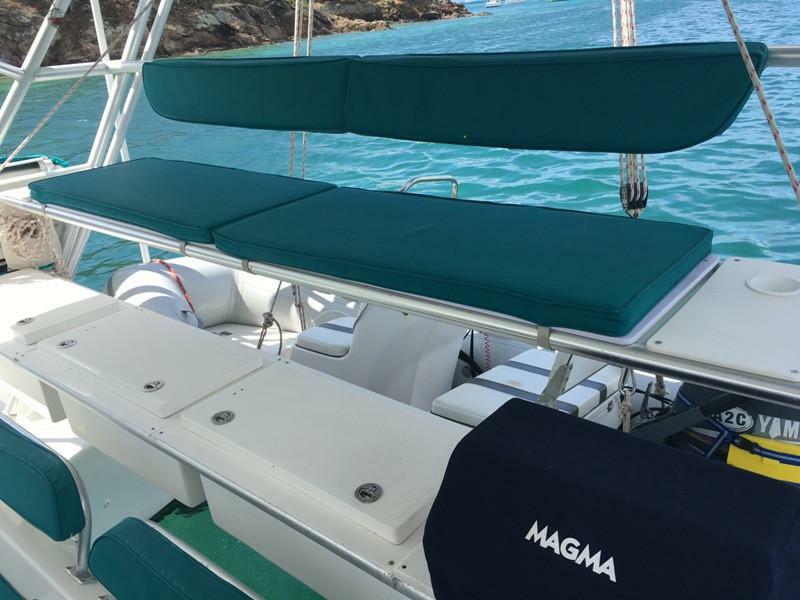 Magma stainless steel propane grill and cover in Cockpit (NEW 2017 @ $750). Bosun’s chair for climbing mast. Bottom sanded to raw gelcoat, primed (2X), top-coated ((2X) overall, (3X) on leading edges) with top-shelf Islands BioCop TF Ablative bottom paint and all vinyl graphics redone (2018). 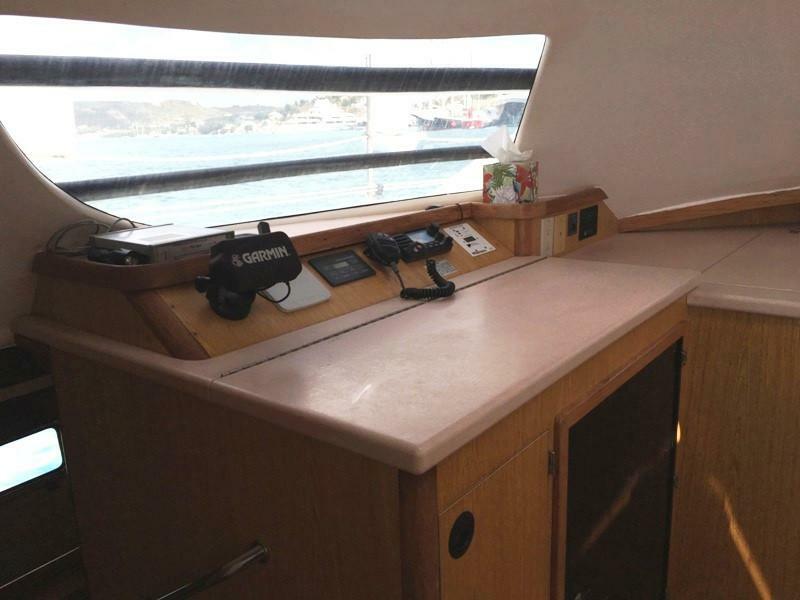 Maxwell 1500 electric windlass and deck switches. Rocna 55# primary anchor with swivel and 150’ of high-test 5/16’s chain. Fortress FX-23 secondary anchor with 300 feet of 5/8’s nylon rode. Ample dock lines, over-sized fenders. 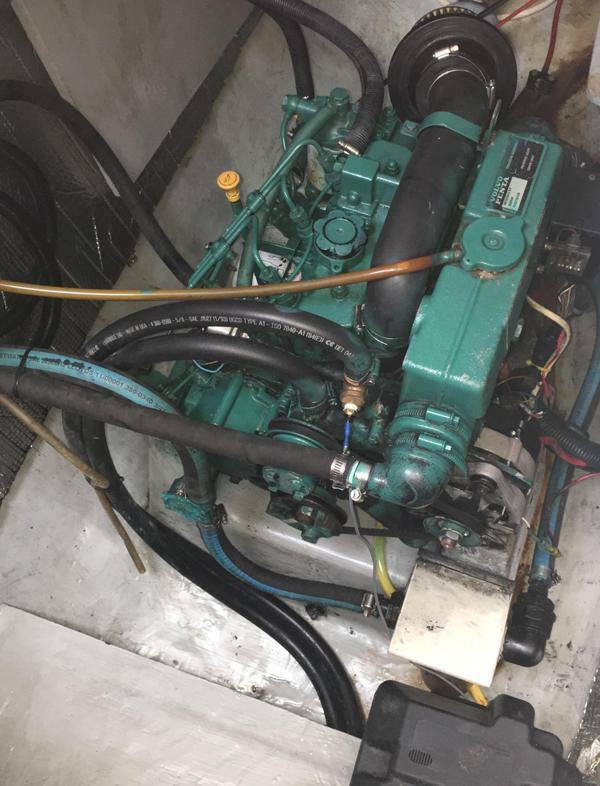 Twin 29hp Volvo Penta MD 2030 Diesel Engines with Volvo Sail Drives- approx. 4000 hrs. (2) CruiseAir HVAC systems with digital thermostats (16K front, 12K aft). Volvo 3- blade folding propellers with line cutters. NEW Stainless steel exhaust elbows (both Engines 2017 @ $1300). Upgraded mufflers on both Engines (2018 @ $500). Added over-sized Motorcycle-style air cleaners (2017 @$500). 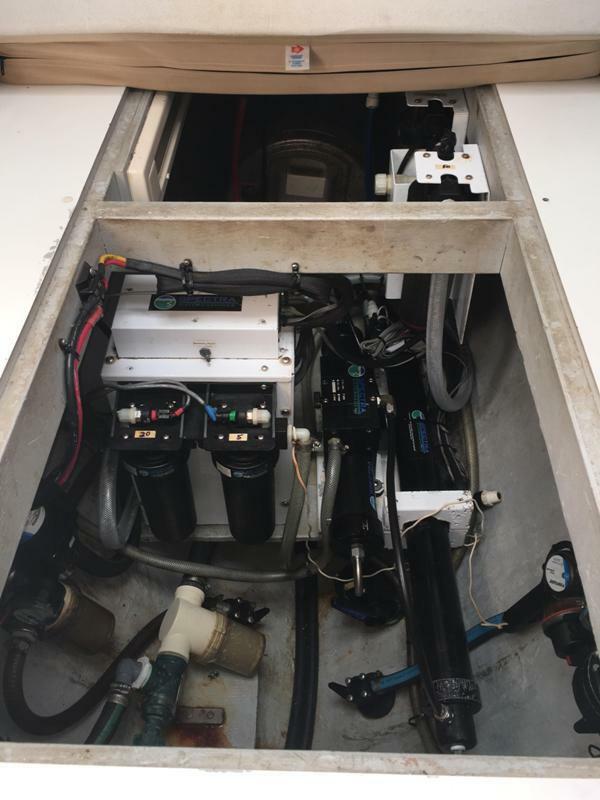 Racor fuel filter systems on Main Engines and Genset (2018 @ $500). Reverso Oil change pumps for Main Engines and Genset. Fuel Tank: Aluminum (100 gallons). Harken 12V 44 Two-Speed Electric Self-Tailing Winch in Cockpit. 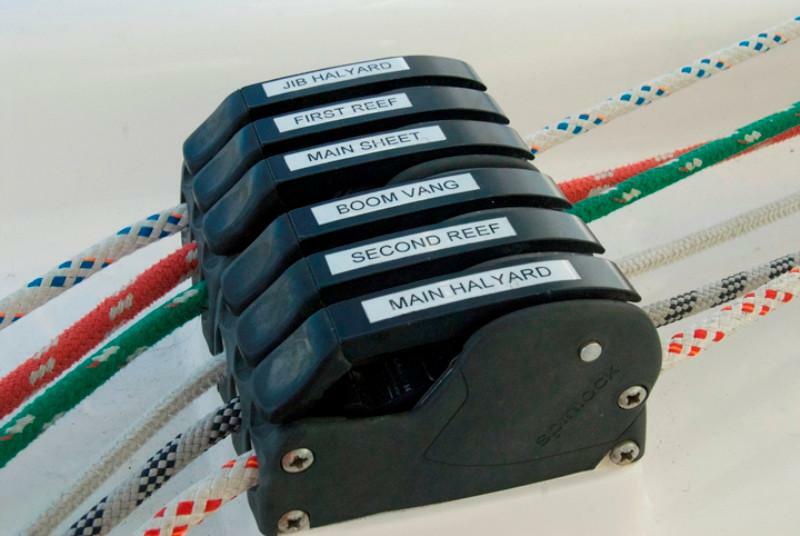 Harken 42 Self-Tailing Manual Winch For Handling the Genaker . 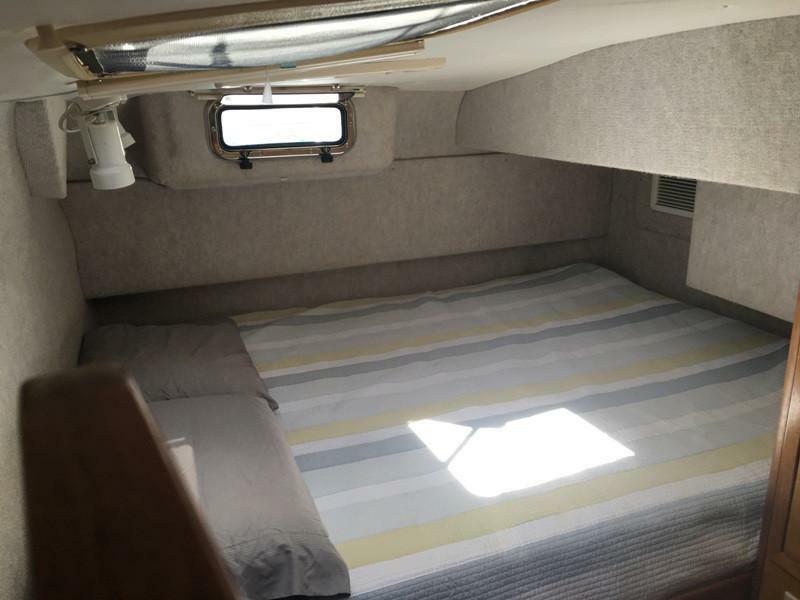 Total Sail Area= 833 sq ft. 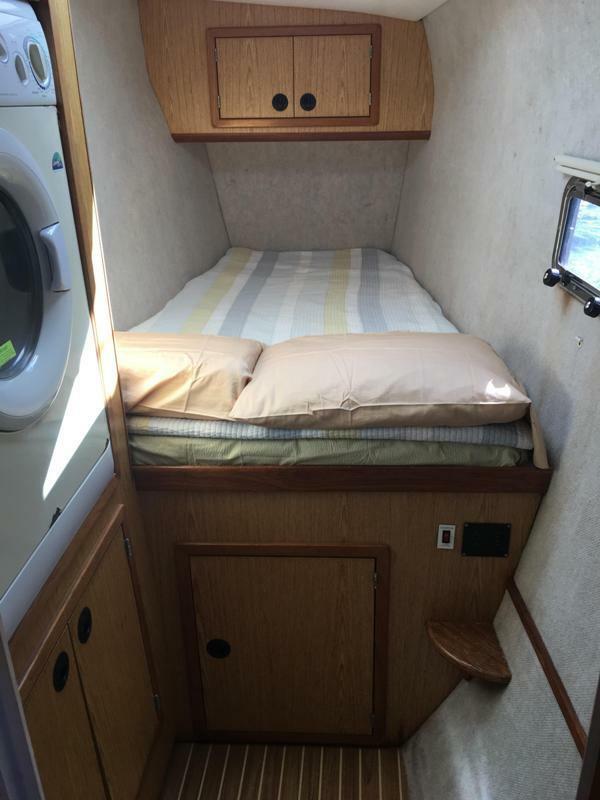 Fully Battened Doyle Mark II Version Main With Full Roach (2012). Garhauer Rigid Boom Vang – upgraded 2019 @ $600. 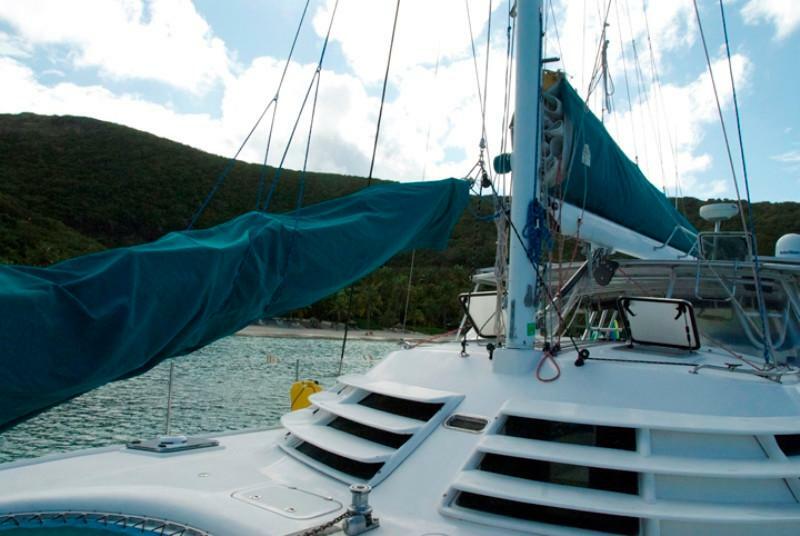 Self-tacking, Fully Battened Jib with Camber Spar (2014). Doyle Full Main Boom Bag with Lazy Jack System. Asymmetrical cruising Code-0 with Sock and Separate Winch. 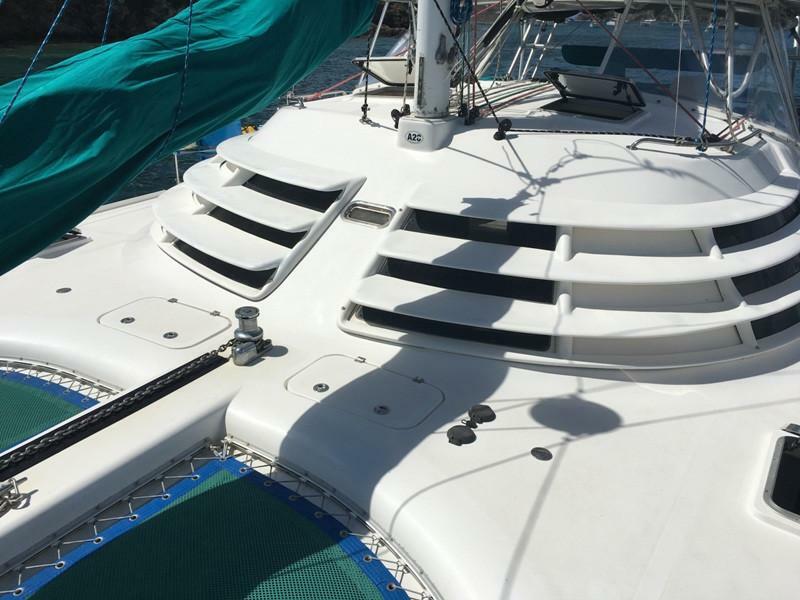 All sheets led aft to Helm with deck organizer/clutches. 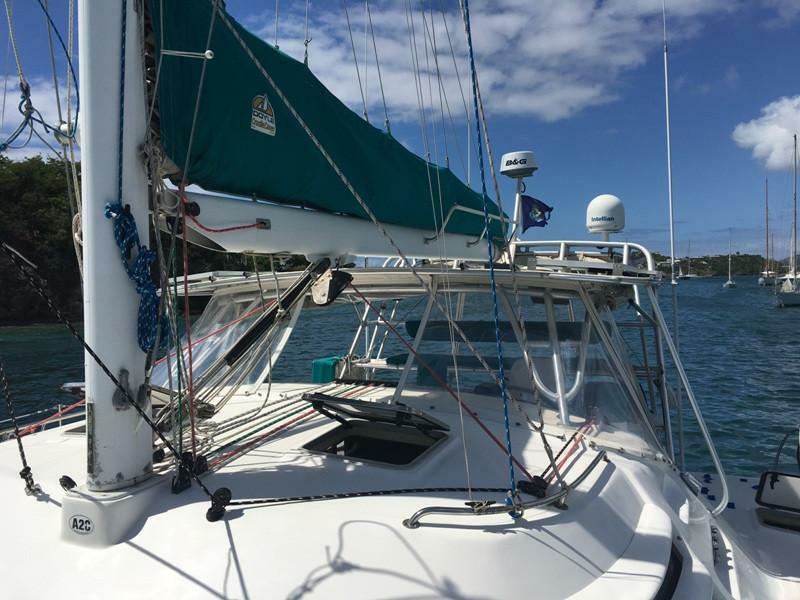 NEW Main Halyard (2017 @ $500). Coast Guard required safety items- fire extinguishers, flares, throwable device. Manta lightning protection upgrade package. Jim Buoy throw type floatation horseshoe. 6 -Person life raft (needs current certification). CO2 Alarm systems for both large Staterooms (2017 @ $400). 10.5' AB Flat-Bottomed 10VS RIB (NEW 2018 @ $4000). 2019 20hp Yamaha 4-stroke electric start engine ($5000). Center console steering with wheel and throttle controls. AB steering seat/console with associated cabling and steering connectors (installed 2018 @ $2500). Rear storage bench seat (installed 2018 @ $400). Power shut-off switch (2018 @ $100). Navigation lighting installed in console (2018 @ $200). 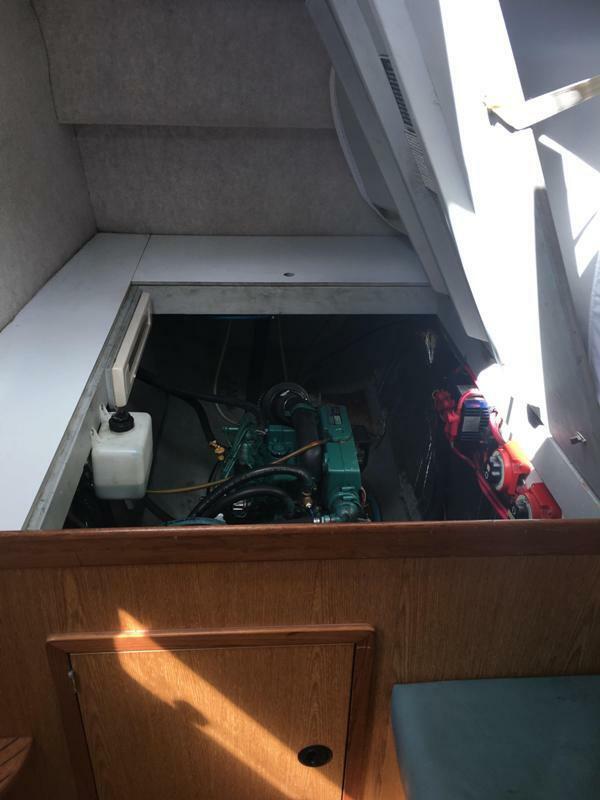 Electrically controlled sump style bilge pump (2018 @ $200).